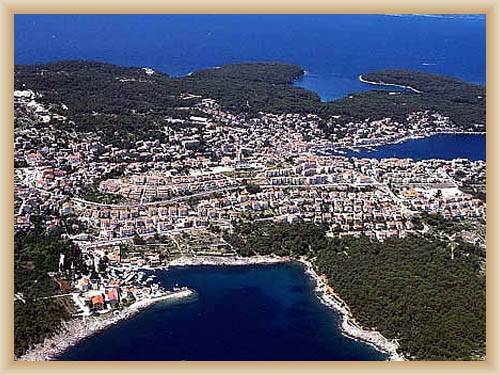 Town of Mali Lošinj is the biggest village on the island and the main harbor of both islands (Lošinj and Cres). 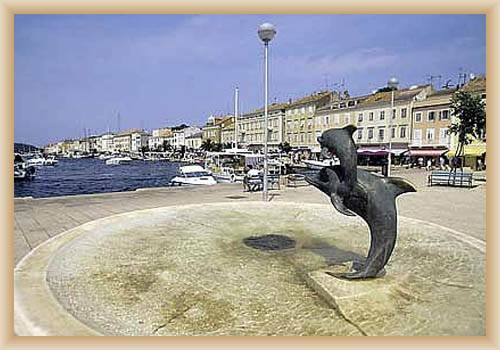 The town lies on the end of protected bay Luka Mali Lošinj. Town has a good climate, great bathing and possibilities of water sports, and mainly has a clear sea. It has enough of vegetation and top services. Status of climatic spa has from the 19th century. The prosperity of island from 19th century is still perceptible. The island was famous for Austrian aristocrats, who built here villas and summer residence. The old town comes from baroque end classicisms epoch, but the town has also oldest buildings, for example the watchtower is from 15th century. Lot of companies takes care about services, accommodations, moneys, cruise ticket, excursion, and etc. The popular attraction is the interesting harbor surrounded greens tops, undercurrent near the sea. The most important historical reminder is first of all the cemetery by the church of St. Martin with tombstones of gone residences, mariners and adventurers from Italy and Austria. The church of St. Maria is located in the centre of the town and was built in the 17th century. The decoration from the church (18th century) is also interesting. Great conditions for swimming are in Cikata’s bay. It is possible to rent boats and yachts there. 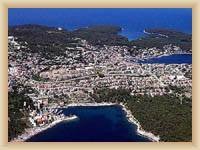 Mali Lošinj offer great conditions for biking as well.